It was a weekend of bugs/insects/creatures I don’t share a common language with. 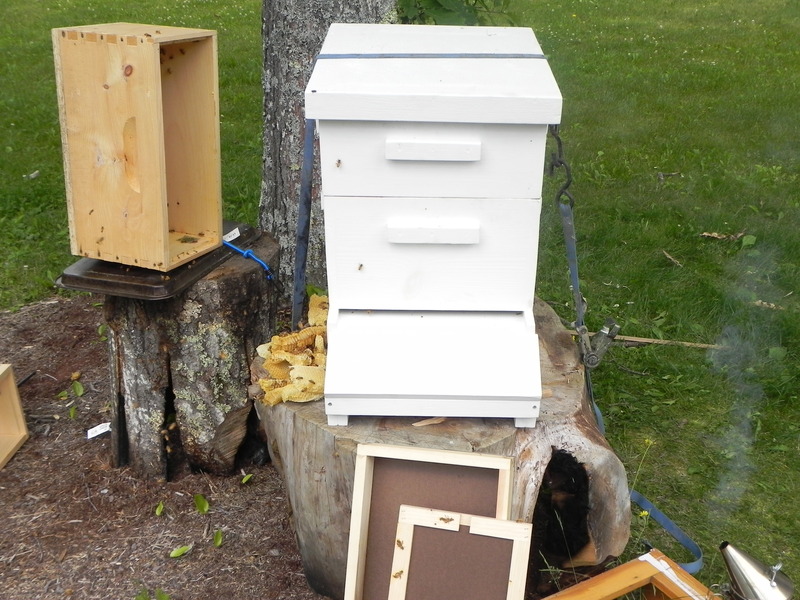 In the nick of time, we managed to cobble together a new hive for the NUC I created on a month ago. I had sent it off to the orchard to figure life out. I then drove it home in the back of the truck early one Sunday morning, popped another layer on top with a deep NUC body and medium frames. (A mistake in bee-to-space calculation I will not make again.) Bees are thrifty souls. If there is a space, it must be filled – Immediately! It was a tricky move to the new hive bodies and set-up. The top of the NUC box was stuck to the bottom box with a thick, gloriously perfect droop of comb. They were doing a “top bar hive” sort of architecture. Unfortunately, I suspected the queen was in the top and to re-pack them into the new hive body meant setting this particular fragile ecosystem aside while I moved the five deep frames from the bottom NUC body to the new hive. No queen was spotted in the bottom hive body so I sweated that I had lost the queen when I broke the top frames loose. It was also getting warmer. The bees were frantic with the massive disruption. I was in flip-flops. Several times, I felt a bee tickling up my sleeve or pant leg and took a slow step back to adjust. I had a wisp of oak leaves to brush them away or gently suggest a direction if it was a large swarm on bare skin. You can’t move fast, and though you listen to their call of increased agitation, you can only go so quickly. At one point, my toes were covered with bees. I rolled my foot and realized if I changed my balance at any moment, I would crush several bees beneath my foot. Doing my best imitation of a yoga crane position, I removed both rubber sandals and from then on I felt the ground hum as I gingerly stepped amid the bark-mulch. 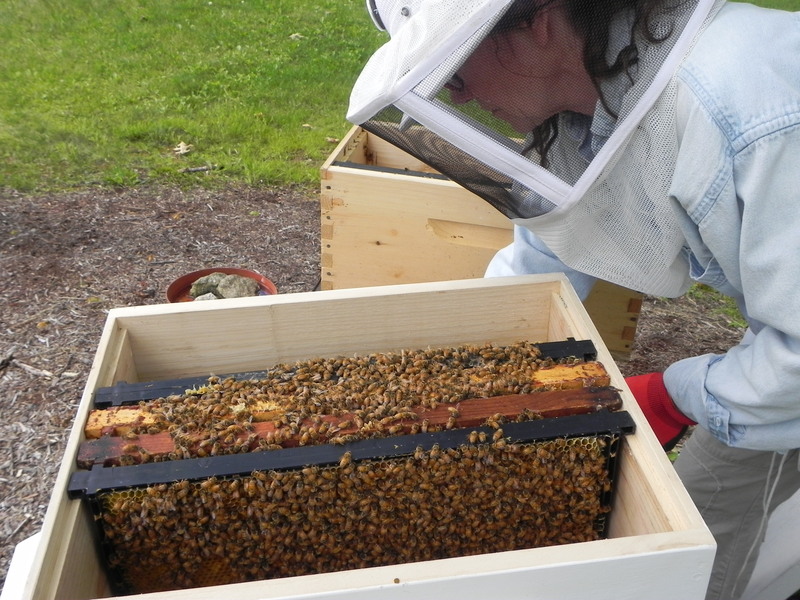 Note the pile of discarded honey comb on the left of the new hive. Such a waste of their efforts but nothing to be done about it. I felt like a mother hen worrying over her brood. Every hour or so I walked out to check them and see if the remaining bees left the NUC body and started setting up house-keeping in their new home. By nightfall, they seemed settled. This entry was posted in memoir. 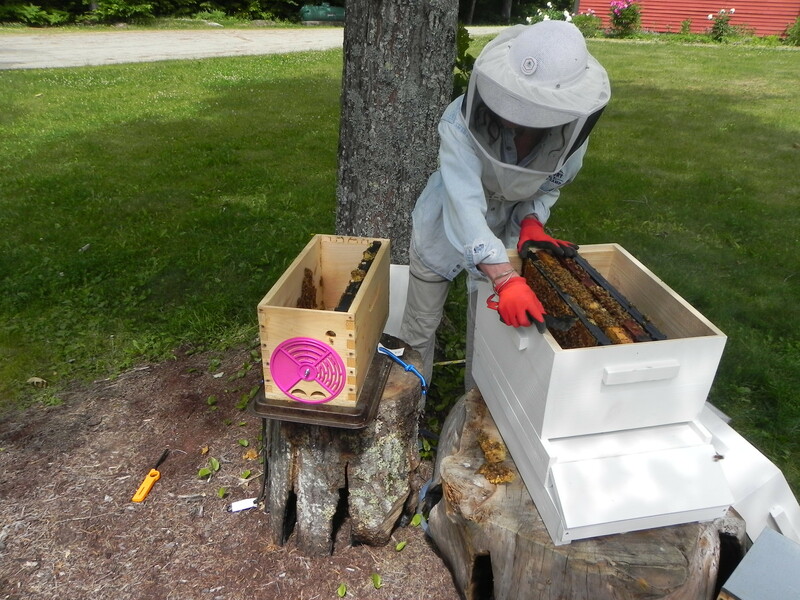 Tagged bee hives, bee keeping, hive bodies, Insects, New Hampshire, NUC, summer bugs. Does the smoke making / smudge pot thing really calm them down enough so they don’t sting? I think it’s funny, you had on all the protective gear, but were wearing flip flops. Did you find your queen? I never did see her but with all the disruption I suspect she was hidden. I did see lots of evidence of her in new brood and larva. I only wear the hat and veil because I don’t want them to become trapped in my hair or accidentally sting my face. They generally are very docile. You make it all sound so idyllic. I love the thought of the gentle, mindful movements, like yoga. Now that’s something I really should do more of. Do you use the discarded beeswax at all? I often use it in the lip balms and body butters I make, it’s wonderful for the skin.